We’re nearly four months removed from the joys of the college gymnastics season, and while the elite season is just now ramping up, we can’t help but miss watching NCAA gymnastics every weekend. Another thing we’re going to miss? All the seniors who graduated and their routines we’ll no longer be able to watch week-in and week-out. To help cure your NCAA blues, here are 10 seniors we’ll miss during the next college gymnastics season. 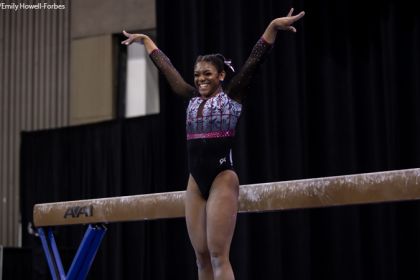 A three-time Big Ten championship all around champion, Melton was one of the most prolific gymnasts in the NCAA over the past five seasons. Although he wowed many with his sky-high double front on vault, Melton’s showcase event was parallel bars, where he used his clean pirouetting work to record an NCAA record* score on the event in 2016. The 2018 Nissen-Emery award winner, given to the best senior in NCAA men’s gymnastics, Melton will surely be missed by the Buckeyes and gym fans alike. *His score of 16.175 was set before the Code of Points changed after the 2016 season. Baker was a standout all arounder all four years while competing for the Illini, having won 30 event titles over the course of his career. Illinois is definitely going to miss his consistency across all six events but mostly his explosive Kasamatsu one and a half that he used to place fourth on vault at the 2018 NCAA championships. Justus played an integral part in Oklahoma’s current streak of four NCAA team titles and undefeated seasons. Having never missed a meet during his collegiate career, Justus was a key contributor on floor, vault and parallel bars during his senior season. A finalist for the Nissen-Emery award, Justus’ reliability to put up a useable score on any event will be dearly missed by the Sooners this upcoming season. Pochinka’s high difficulty and ability to stick set him apart from a strong Minnesota vaulting lineup during his time in Minneapolis. Anchoring on vault, Pochinka competed a huge double front that always fired-up not only his teammates but also the crowd. His vaults also boosted the team’s scores, with Pochinka breaking into the coveted 15+ range twice during the 2018 season. The Golden Gophers will have a hard time replacing Pochinka’s vault and the energy it created as they try and improve on their NCAA championship runner-up finish in the seasons to come. 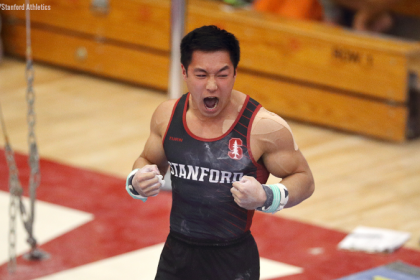 Two-time defending NCAA high bar champion Neff was also one of Stanford’s best all arounders during his career for the Cardinal. His crisp lines and high-flying tkatchevs allowed him to minimize execution deductions and outpace the field for the title two years in a row. His beautiful execution translates to his other events as well, making him one who will be missed by fans in Palo Alto and across the nation. The extremely powerful King contributed on many events for the Cornhuskers during his collegiate career but stood out primarily on vault and floor. In a floor exercise that featured a double twisting double back, King mounted with a double front pike and dismounted with a half-in half-out that truly showed off his fantastic flipping ability. Next season Nebraska will surely wish they still had these dynamic routines from their All-American King. Having competed in several world championships representing Bulgaria, Aleksandrov used his international elite experience to become one of Cal’s best all arounders in program history. Aleksandrov’s highlight event was high bar, where he competed a jam-packed set with back-to-back release moves and tricky pirouetting combinations to generate a highly difficult routine. The Golden Bears will have a hard time replacing the routines lost from the reigning MPSF high bar champion. Hodges was a regular in both the Hawkeyes parallel bars and high bar lineups, but his biggest value to the team was his high scoring pommel horse routine. His long lines and swinging prowess helped him rake in difficulty while maintaining a respectable execution score. Iowa will definitely miss Hodges’ consistency on the event, having only dropped below a 14.000 on the event three times during his final season in Iowa City. Having not competed for a big-time program, Graff isn’t a household name but was a key contributor to Springfield’s lineups throughout his collegiate career. Graff stood out on still rings, where he used his strength to master the different holds necessary to bring in the big scores. 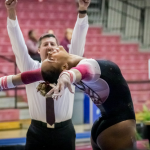 A qualifier to the second day of the 2018 NCAA Championships in the all-around, Graff’s scores will be greatly missed by the Pride next season. A former all arounder, Belanovski was a reliable member of the still rings, parallel bars and high bar lineups during his senior season in Ann Arbor. His high bar routine kept fans on the edge of their seats with his variety of release moves and gorgeous full-twisting double layout dismount, usually for a stick. Next season Michigan will need to find a new high bar standout to replace the thrill of watching Belanovski compete.